Marvel Heroes Battle Dice Site Now Open! This is the on-line home of Marvel Heroes Battle Dice – the site that will help you Load up with information, Roll with knowledge, and Battle with success! FAQs: Frequently asked questions and answers! Products: Pictures, figure galleries, and information about Marvel Heroes Battle Dice products! Gallery: A detailed look at all the figures in the set! You can also play on mobile casinos online from any place with Internet connection and have a lot of fun while trying the many different games. The Marvel Battle Dice rulebook is now online as a PDF file! Don’t have Adobe Reader for viewing PDF files? Get it here . It’s free. We also have a much higher resolution version that can be printed and assembled into a duplicate copy of the rulebook provided in the starter set. Instructions to assemble it are below the link. 2) Print pdf page 1, centered. Flip the page and print pdf page 2, centered, on the back. 3) Print pdf page 3, centered. Flip the page and print pdf page 6, centered, on the back. 4) Print pdf page 4, centered. Flip the page and print pdf page 5, centered, on the back. 5) Stack your printed pages so that when you look at them the booklet page numbers (in the red circle) read 2 (bottom page), 4 (middle page), 6 (top page) in the lower left corner. 6) Fold the stack over. Trim away the edges. You now have a spare rulebook. Enjoy! The first of the wallpapers for PC desktops has been added to the site. 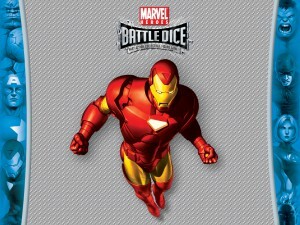 A complete list of all the Marvel Battle Dice is now available for Series 1. It makes a great team-planning aid and a handy reference when trying to figure out what sorts of nasty things an opponent might use on you at a tournament! New Character Powers for Series 2 Revealed! Here’s the lowdown on the soon-to-be-released Series 2 Power Icons and what they do! 1) Immovable: If this figure is defeated in battle by less than 3 points, leave it in the Combat Zone. This figure automatically takes part in the next match-up instead of your other figures. Reroll its battle die during the battle. If this figure is still in the Combat Zone at the end of the battle round, place it in your Staging Zone. 2) Alter Reality: If you win this battle, you can move one die from your Staging Zone into your Dice Zone. 3) Weather Control: Your foes’ Ranged Weapons grant them no bonuses. 4) Shrink: All foes subtract –2 from their battle total. Foes with Shrink or Super Senses ignore this penalty. 5) Time Travel: You may reroll your battle die once in this battle. 6) Poison: If the winner of a battle beats this figure by less than 3 points, place the winner in your Holding Zone. 7) Feed: If you win this battle, place a token (a penny, etc.) with this figure. Add +1 to this figure’s battle total for each such token you have. 8) Animal Control: If this figure loses a battle, roll a die. If the result is odd, the figure’s animals rescue it. Place a token (a nickel, etc.) with this figure and place it in your Staging Zone. If the figure already has such a token, do not roll a die.